All transactions are safe and secure with a reliable history in online purchasing behind each of our associates. Buy the Chut Up! Donnie Darko t-shirt to own Donnie Darko clothing and merchandise. The front of this tee displays the Donnie Darko quote, "chut up!" The expression is a variation of the more common, "shut up." It can be used to let others know that you don't feel like communicating, or it can be directed at someone who you want to stop talking. In the movie, Cherita Chen says, "Chut up!" after Donnie removes her earmuffs. 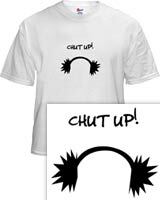 "Chut up" is not as insulting as "shut up", as it is more of a plea to alleviate one's own discomfort with discussing a certain topic. In addition to the Chut Up! Donnie Darko tee above, browse the Donnie Darko Clothing Gallery for more apparel like men's and women's clothes, kids shirts or hoodies.